At John Elliott Interiors, we know that establishing trust between our clients and our design team is an integral part of designing and decorating homes. That’s why we enjoy learning about our clients’ lifestyles and allow our customers to get to know us in return. John Elliott Interiors is more than meets the eye and we invite you to find out why. A: I came to the Lake of the Ozarks in summer of 1970 (for the first time) as the keyboard player on the LARRY DON…we played 100 sold out cruises in a row. My brother Bruce Elliott and his wife Judy got married (1969) and moved here (to the Lake) in 1970. So for the next couple of decades, I came to visit my brother and sister-in-law at The Lake. Later, I bought a couple different condos & boats. I moved to The Lake full time in 2005 to prepare our billboard company for sale to a J.P. Morgan company, Olympus Media (sold in 2006). Q: How did you get started in the interior decorating business? A: My undergrad and graduate degrees are in design. I taught design at Penn Valley Community College, Virginia State University and Stephens College. Later, I was a partner in an ad agency (Muller & Co.) in Kansas City and designed hundreds of publications, ad campaigns, posters and displays. I left KC in 1995 after 15 years in [the] design/printing business and moved to Columbia, Mo to become a partner in ELLIOTT/McDONALD OUTDOOR, a new billboard company (with Bruce Elliott and Mark McDonald). We built 925 Billboard faces and sold in 2006…then we retired (sort of). During my retirement 2006-2009, my brother and I designed/built 3 large spec houses in The Villages and 5 spec homes on the golf course at Osage National Golf Resort (about $14,000,000 in three years). * The real answer is my mom, Ruthie, told me I should have an interior design business a log time ago…and repeated herself many times thereafter. She never got to see it happen…but, she was right, I do enjoy this the most. Q: What do you enjoy most about owning John Elliott Interiors? A: The people. We get to meet all kinds of people from all across the Midwest. City folk from St. Louis, KC, Chicago, Des Monies, Omaha. Lots of small town people and farmers from Central Illinois, Iowa, Nebraska, Kansas and of course, Missouri. Everybody has a unique story. The one thing they all have in common is their love of the Lake of the Ozarks. Although we design & decorate homes in all Midwestern states and Florida’s southwest Gulf Coast, it all starts at Lake of the Ozarks. The inside people…my design team are all the best! My two sons, Bob & Luke, Chris Newsom and Sally Herrin have all been with me for years. Service, integrity, quality, detail, class – they all work hard daily to create elegant rooms and happy clients. Relaxing at home with my wife Connie, a cocktail and good music. GOLF (I live at Osage National #5 on links) usually 9 holes is enough for me and about all I can fit in (duffer). Boating…I’ve had a Bennington Tritoon for 12 years. Still looks like new and runs great. We like to cove out and swim, [going] “Pool Hopping” and visiting my customer/friends, and going to dock parties. Connie and I have 5 mid-30s sons with wives and 6 grandchildren who all enjoy to boat. Happy Hour at JB Hook’s (I’m a regular)! Travel – I enjoy going to our jobs. Driving the Midwest is beautiful and relaxing. We fly down to the jobs in Ft. Myers / Naples / Marco Island. Went on a Viking River Cruise last year through Germany, Austria, Hungary and Czechoslovakia – which was unbelievable! I was shocked by the magnificence of Budapest. * We have a lot of close family at the Lake which I do all of the above with! A: New Zealand – The landscape seems like a bit of everything. Mountains, Waterfalls, Ocean, Beaches, Rainforests…mystical, unlike most places I’ve been. I’ve seen all but three of four states in the U.S. I’ve also been on trips to France, Italy and Northern Europe. Lots of Mexico trips, and cruises in the Caribbean, Panama & Costa Rica! Q: Is there a favorite line you carry at John Elliott Interiors? Q: Do you have a favorite room to decorate? A: The next one I’m creating! I don’t really have a “favorite room” to design. After traveling to Italy it becomes apparent that new ideas are hard to come by and almost everything has already been done. For example, the shops at Pompeii had sliding glass doors and granite counter-tops before Christ. I try to incorporate a pleasing and elegant selection of elements into a new combination to create a room that will not go, “out of style” in a couple of years. Most of the rooms I create include art, plants and lighting [to make] that “Wow” in the room. Q: Share a meaningful piece of advice someone gave you. A: Yesterday is a spent check. Gone. Can’t change it! Tomorrow hasn’t happened & might not! Today is life…make it the best day ever. I try to live this. If I live one day (TODAY) at a time. I’ll probably look back in a few years and find out I had a great life. A: I played at the Whiskey: A Go Go in Los Angeles when I was 15 (1966) for two months. The band was out of St. Louis – Herman Grimes & The Spectres. It was an R & B band with a horn section (trumpet, sax, trombone). I played keyboards…We opened for The Doors, Janis Jopiln, Jimi Hendrix, Question Mark & The Mysterions and others. I started playing piano when I was four. My first recital was at age five. I started playing professionally when I was 13. First records were released in 1965. 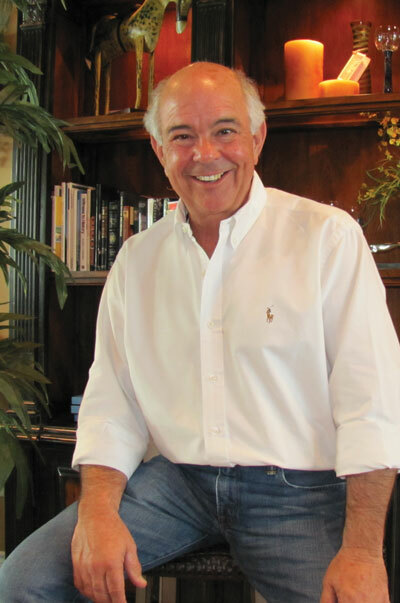 We hope you enjoyed getting to know more about John Elliott and his interesting road to owning the Lake of the Ozarks premier destination for all things interior. Stop by the John Elliott Interiors showroom in Lake Ozark – John and his team are always ready to visit!